When his work in the Pima Villages was finished, John Bartlett turned south toward Tucson on his way back to El Paso. While there he climbed a hill near the Mexican settlement to sketch the view to the northeast. In his sketch he shows the convento, chapel and mission of San Agustín with the town and Mexican Presidio in the distance across the Santa Cruz River. When Bartlett visited Tucson it was still in the Mexican province of Sonora. After the United States bought this area in the Gadsden Purchase, the mission was deactivated and fell into ruin. Almost nothing remains today. 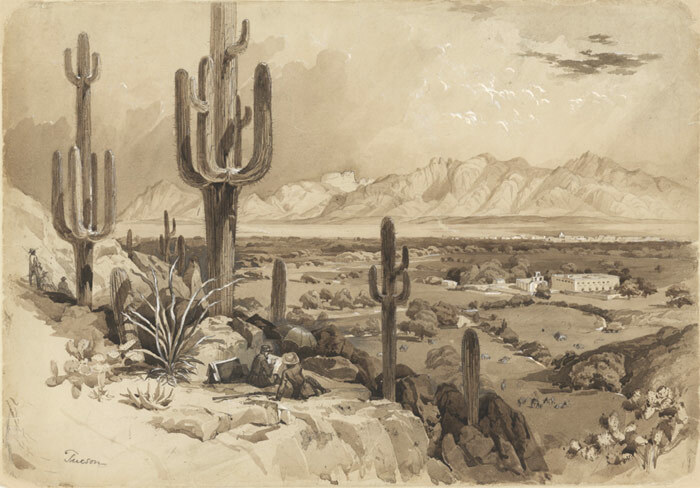 Bartlett’s pencil and wash sketch of Tucson. John Carter Brown Library. View of Tucson from Sentinel Peak. Photo by Jerry E. Mueller. 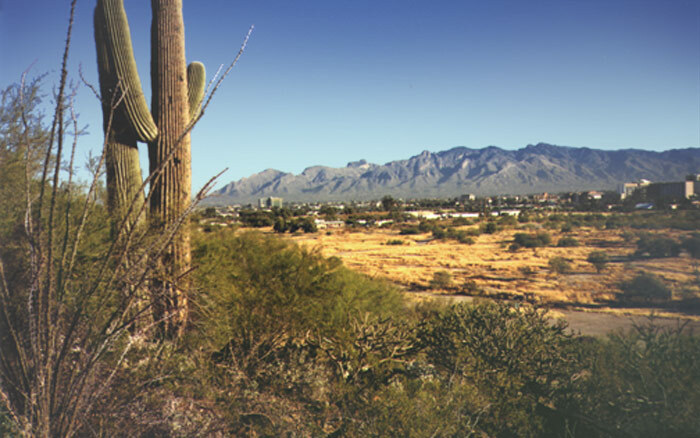 July 17th …Tucson is the most northern town in Mexico, and a very old place. It is found on the oldest maps, and is referred to by the early missionaries. It has always been, and is to this day, a presidio or garrison; but for which the place could not be sustained. In its best days it boasted a population of a thousand souls, now diminished to about one third that number. It stands on the plateau adjoining the fertile valley watered by the Santa Cruz River…In addition to the river alluded to, there are some springs near the base of a hill a mile to the west of the town, which furnish a copious supply of water. Near these is a hamlet, and a large hacienda, which in former times must have been very rich. It is now in a decayed state, and but a small portion of its fine lands are cultivated. This hacienda is seen in the foreground of the annexed sketch of Tucson. In trying to locate the precise viewpoint of this sketch on the lower eastern flank of Sentinal Peak (aka “A” Mountain) I determined that the spot Bartlett was sitting on as he drew was removed several years ago when part of the mountain was blasted away to re-align South Grande Avenue in Tucson.